For almost a week Bangladesh is undergoing a huge demolition drive. 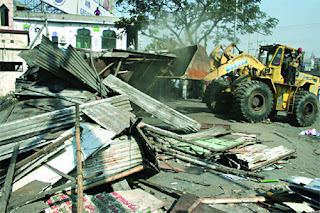 Bangladesh Police, the Army, and the Municipal Authorities across the country are working very diligently to demolish all illegal structures erected inside the cities and along the highways. People have encroached public space and they built shops, clinics and houses. Now, under the emergency law, we’re knocking down everything. Aren’t we citizens of Bangladesh proud and pleased with this overzealous public interest activity? What happened to the Law, Public Enforcement, and Municipal Authorities when these structures were erected? What are the reasons behind this noble act? (1) We’re knocking down illegal building structures to rebuild them again? (2) Is it a public strategy of the Caretaker Government to earn cheap popularity and acceptance with citizens? (3) Is it to prove the poor oversight of the previous BNP-Jamat Government? (4) Is it to redesign the cities for beautification? (5) Is it a new chapter in Bangladesh? (6) Is it to make cities more beautiful and attractive? Of course, we need to make our cities the most attractive and beautiful place in the country. If we don’t clean up, what will the next regime encroach again. Instead of knocking down the increasing socio-economic divide, we need to knock down illegal building structures. We’re impressed with the most expensive cars driving along the city streets. We can not knock down the root of all corruption as there’s no limit in tax evasion and corruption. When we can’t knock down the corrupt people’s power structure, as it will hurt the most powerful people of our society. Therefore, at least knocking down the illegal structures is really impressing the people of Bangladesh. Cheer up Bangladeshis!!! We congratulate the prudence of the Caretaker Government. Please continue cleaning up our cities as we can not clean up our poor society. Since independence, our health care sector has received enormous amount of donations from abroad and funds allocated by the government. Unfortunately, all the financial resources have gone down the drain. According to several surveys, it is the most mismanaged, inefficient and corruption-ridden sector in the country. One need not deep dig to unravel its ills. Just take a look at the two big hospitals in the capital – Dhaka Medical College Hospital and Bangabandhu Sheikh Mujib Medical University (formerly IPGM&R). These have become the last resort for people of low socio-economic status to seek medical service. People who can afford it go to private hospitals and clinics. BSMMU was transformed into an autonomous body during the rule of Awami League government. This ill-advised decision has turned this institute into a most corrupt and politicised organisation in the country. Professors and doctors of all categories are using it as a tool to further their careers and private practices at the expense of the superior service they were supposed to provide to the patients as well as students of higher learning. The quality of education is so poor that we have not yet been able to get recognition of our post-graduate degrees from any internationally acclaimed academia. It is even very sad to know that the failure rate in any post-graduate course is appallingly high. The professors are not held accountable for their dismal performance. In any developed country these so-called professors would have been thrown out straight away. But instead they simply get away with their shameless failures as academicians because of BSMMU’s ‘autonomous body’ status. BSMMU’s staff have become untouchables! In the past one could replace a professor for his incompetence with a qualified one from another government run hospital. You will hardly see any of these professors and doctors in the premises of BSMMU after 2:30 pm. They are all busy practising at their private chambers while using the name of the post-graduate institutes to their optimum benefit. BSMMU has also become a den of clerks and peons acting in concert with the administrative section to grab money out of students and trainees. But one thing I want to put emphasis on is that Bangladesh should allow many more foreign-owned private hospitals staffed with foreign specialists to come to Bangladesh. Thirty-five long years have gone by. So has billions of dollars. But unfortunately there is not a single modern hospital that Bangladesh can boast of. Neither can it boast of healthcare expertise at par with medical professionals of international repute. If we have more private hospitals, only then an atmosphere of higher learning will prevail in the academic institutions and our new generation will immensely benefit instead of decaying in the hands of these indigenous witch doctors. It’s imperative that joint collaboration in the field of medical education is immediately initiated at the private level to train our future generation of doctors. I think we now have the right person at the right time at the right place. We have a golden opportunity knocking at our door! He is General Motiur Rahman of AFIP. What he should do is rid the government run hospitals of inefficient cadre-based appointees of the former corrupt, criminal-ridden BNP-Jamaat-e-Islami government and cancel all appointees of the former health minister Mosharraf Hossain and his cronies. Both Professor Hadi and Dr. Zahid of DAB and BMA should be put behind bars immediately for misappropriation and plunder of the healthcare sector resources. The DAB was basically run by the same syndicate operating from Hawa Bhaban in collaboration with the Prime Minister’s Office. It was Zahid, Tareq and his wife who were the mastermind behind politicization of the healthcare sector. They have turned both DMC&H and BSMMU into a BNP-Jamaat-e-Islami cadre based institution. The Health Directorate also needs to cleansed of the putrefying obnoxious corrupt thugs of Hadi-Zahid clique. The BSMMU has become a den of thieves. Nothing gets done without bribery. The clerks running the clinical/hospital administrative wing and academia have indulged in rampant corruption for the last five years. Ratan, the PA of Professor Mannan, Khalequzzaman and Shahjahan of the student’s enrollment/academia section in connivance with the Registrar’s office were the most corrupt of all. A lot more would come out if RAB takes these bastards into custody and beat them up to peel off their butts. Professor Mannan and Mobin Khan should also be interrogated for ruining Bangladesh’s healthcare sector. General Matiur Rahman must clean up the mess created by Khaleda, Nizami and Tarek gang of mobsters. Her should ban politics in all educational institutions. Physicians must behave professionally and responsibly. No one should be given extension. It creates a roadblock for competent and hardworking professionals to climb up the career ladder. The government should seriously think of sending junior professionals and students abroad to Thailand, Malayasia and Singapore for expertise and training. These countries have moved far ahead of us in the last decade and a half. I am pretty confident Dr. Motiur Rahman has the dynamism and flair to leave his everlasting impression as the trendsetter in Bangladesh’s gasping healthcare scenario. Just do it! Let bangladesh blossom as its next door Asian neighbors on all wings!! It is all very well the army and the municipal authorities are demolishing all illegal buildings, but spare a thought for the people who occupy them espcially the one's who have no where to go, I know it is the right thing to do, but there will be reprocussion if these same people have nowhere to go, espcially if their livelyhood depended on that, so some degree of thought was required before just turning up with diggers. I welcom the propect of the recent noble prize winner declaring his intention to start a political party, one must ask what is is motive bearing in mind he was educated in USA and has strong linke Yanks, will he become a puppet for the yanks just like the previous government? In my Opinion the media should start acting more responsible and stop trying to immitate the western media and high light the real problem that our beloved country faces and that is lack of economic progress and lack of jobs for the rural peole, the lack of infastructe to control the annual water falls, the bloody basic amenities that we human needs, the luck of goddam politician stealing and or selling all the state assets to europeans for peanuts in return for personal gains. I think the new Government of BD should ask the expatriots to contribute in return for some profits to help build bangladesh that way the country will have intrest free currency to develope and contry. the Ex pat sends money to loved ones and to their bank so why not encourage them to go direct partnership with an approved government agency and start a developmnet fund so every one benifits. I very much look forward to comments from people who may or may not agree with me. The government should also make it mandatory for all government-run tertiary and academic hospitals to immediately qualify for WHO-UNIDO sponsored ISO and other international healtcare management quality assurance certifications. Now is a golden opportunity to get things done after what Khaleda's "Tin Falu" and "Bhumi Dosshu Abbas" has done to the country's relief items. Shame on Khaleda for bringing grave diggers and dacoits like Tin Falu, Bhumi Dosshu Abbas, Lalbagh's Sontrashi Pintu and Goonda Salahuddin into politics. Khaleda has polluted the holy environment of the Prime Minister's Office by keeping criminals as her companions there.